Thank you all so much for your input on my rug saga! I think for now we’re going to hang tight until we decide on a sofa. But, I do have something for you all today as a token of my everlasting appreciation for you… a cocktail recipe! 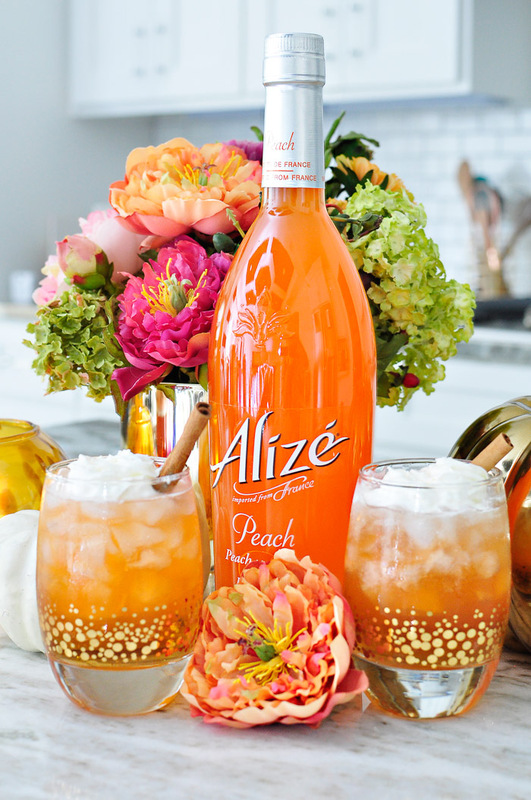 I’m thrilled to partner up with Alizé via One2One Network to showcase their delicious Peach Passion and Gold Passion liqueurs today. All opinions and cocktail creations are my own. 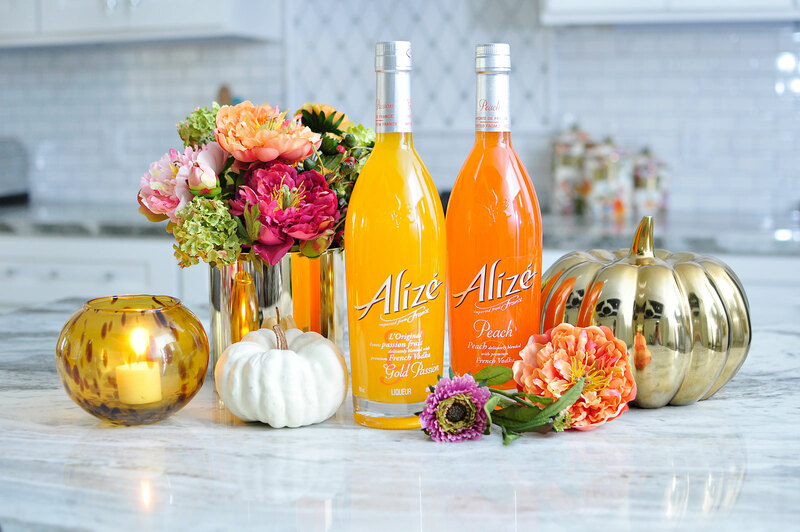 At a super affordable price point of about $17, Alizé infuses premium French Vodka with delicious, fresh flavors from all over the world. It’s great on its own over ice or used as a mixer to create a cocktail which is what I opted for today. 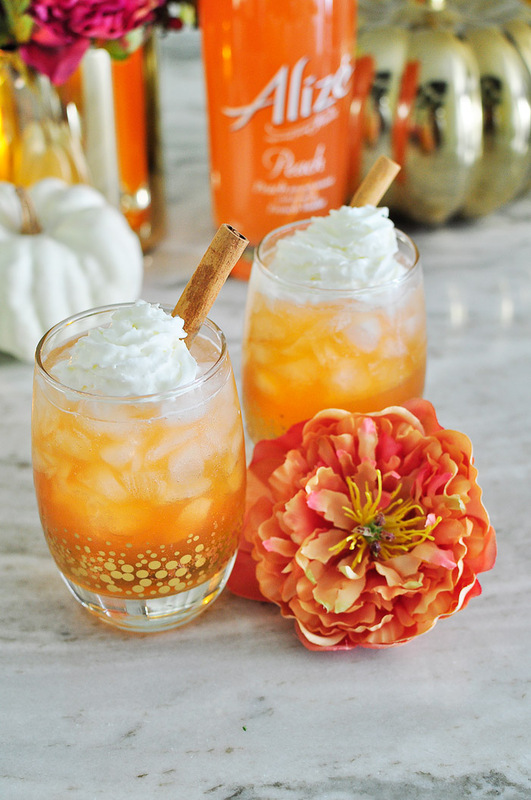 Peach is one of my most favorite flavors, so I thought about what kind of fall cocktail would be great using peach. Then it came to me- a peach cobbler-esque cocktail. I did several trials to get the recipe ratios perfect, and my husband even gave his stamp of approval (he’s a craft beer guy, so for him to get excited about a cocktail says a lot). 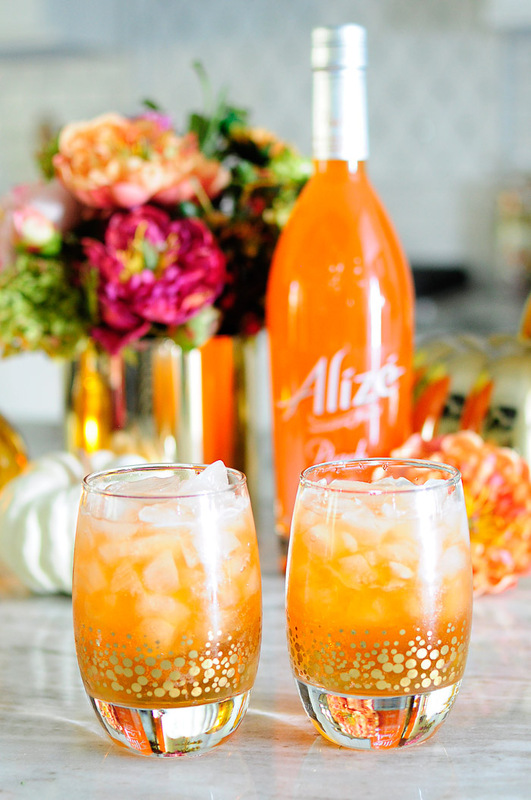 This cocktail recipe is perfect for a girls night, Sunday dinner or brunch. It’s sweet, creamy, and an unexpected surprise ingredient will have everyone asking for the recipe. 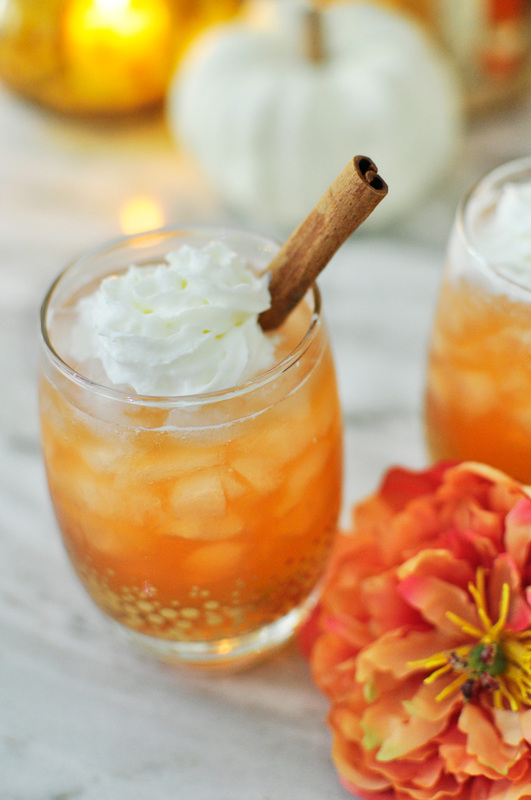 You can easily make a large batch of this and serve it in a carafe. Step 1: Fill a glass with crushed ice. Top with cream soda and butter extract. Step 2: Add in Alizé Peach Passion French Vodka. Step 3: Top with whipped topping and garnish with a cinnamon stick. This recipe is so simple, and the butter extract and whipped topping add that buttery, creamy flavor you think of when you think of a peach cobbler served with ice cream. The hint of cinnamon from the cinnamon stick also kicks up the flavor a bit. My favorite part though, besides the peachy, delicious, fizzy taste is the color. 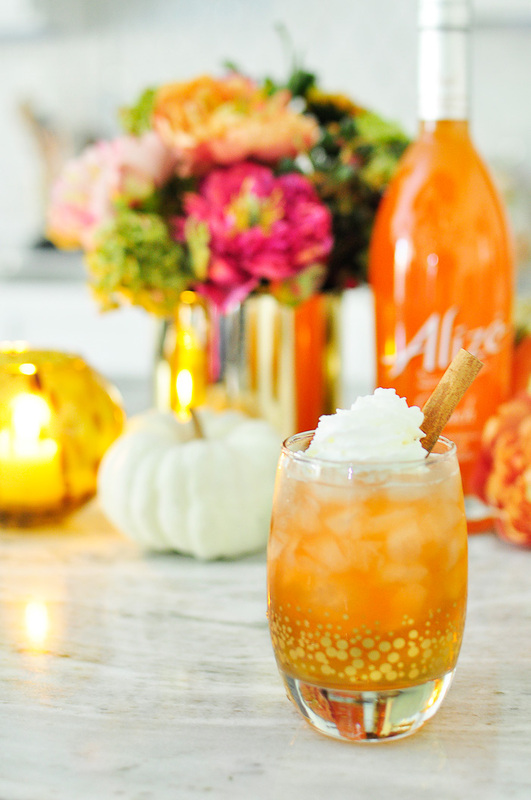 It’s a gorgeous fall drink that comes together easily. If you’re feeling extra festive, you could add in some diced frozen peaches. Definitely make sure to pin this recipe for later. How great would this be as an after dinner drink? 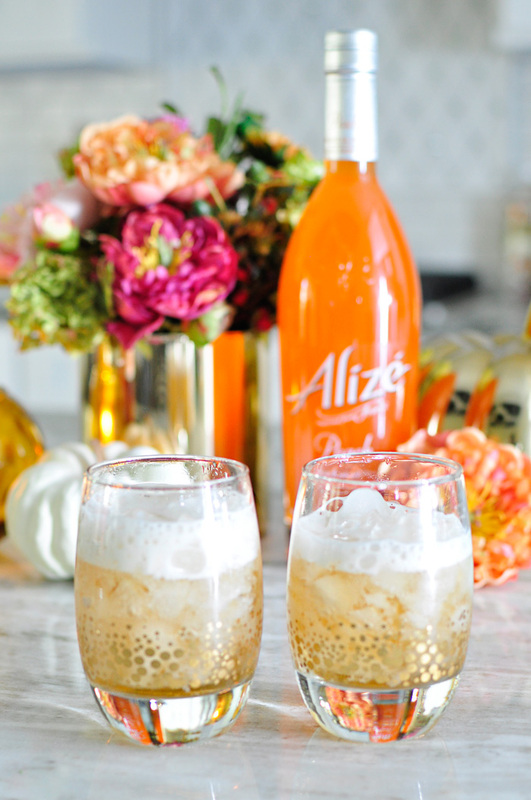 I hope this cocktail recipe inspires you to shake up your cocktails this fall and add in some Alizé French Vodka. Besides being affordable and packed with exotic flavors, the bottles are beautiful and will add a pop of color to your bar cart. Life is more fun in color!